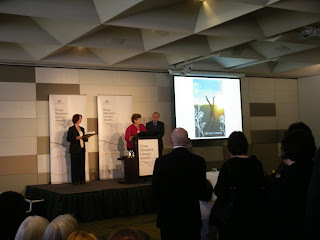 I'm delighted to welcome Lorraine Marwood to The Book Chook today. I recently reviewed Lorraine's book, A Ute Picnic and Other Australian Poems, and was thrilled to see that she has just won the Prime Minister's Literary Awards for children's fiction with her verse novel, Star Jumps. WOW! If you think you'll find it as fascinating as I did to listen to Lorraine discussing the background to her book, you can catch an interview with her on Bush Telegraph. Scroll down to Thursday 18 November where you can listen to Lorraine’s interview under "Star Jumps". 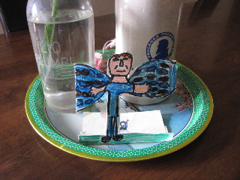 Today Lorraine shares some tips about getting kids involved in reading and writing poetry. I just had to quickly write down a small poem to show what poetry does! What is poetry? Is it the nursery rhymes we sing to our children? Is it Shakespeare and all that high brow stuff? What is poetry? It's a chant, a rhythm, a condensing of a moment in time in all its richness. It's the world written down in 3D sensory expression! How can you as a parent help your child to a lifelong enjoyment of poetry? Read nursery rhyme collections- there are many new versions around. Read aloud as many poems as you can- anthologies are great to share a variety of poets. At www.lorrainemarwood.com I have a two word strategy to download under the resources section. The Poem a Week Project: an online resource of many contemporary Australian children's poets. 1.Have fun with words- look at the endless possibilities- like onomatopoeia - the sound of words - like umbrella. Keep them in a journal/diary/home made book. Poems can be visual- like concrete poems or shape poems. This site is for online writing and shape drawing for concrete poetry! The title of the drawing is Jack Frost but I ended up with a poem about puddles- that's the beauty of writing- there is no right or wrong answer- you are in control. Now this poem didn't just present itself- I wrote another version about Jack Frost himself. This lead to puddles and what one can see in a puddle, and so this poem evolved. Above all enjoy the experimentation and fun that comes from poetry. It is concrete images, sensory detail and so vibrant! 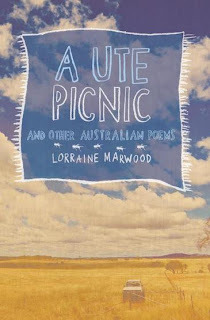 Lorraine Marwood is a poet and author- she loves taking writing/poetry workshops for all ages. I love reading to my children but it never occured to me to write with them (despite the fact that I'm a writer). Imagine my surprise one day when I found a poem in a notebook tucked under my 7-yr-old daughter's pillow! It was breathtaking. I submitted it to a statewide contest and it won first place. I can't believe I never thought to sit and write with her. Children have such incredibly creative minds, so how wise to start them exercising that creativity at a young age. Great post. What a delightful surprise that must have been, Wanderlust! I think you're right, giving our children opportunities for all sorts of creative expression pays dividends. And letting our kids see us read and write shows them we value those pursuits. As a former teacher and a verse novelist, this made my heart sing! Caroline, you've just taught me even a blog comment can be poetry! this will surely help my child..
That's good to know, Jignesh bapna!